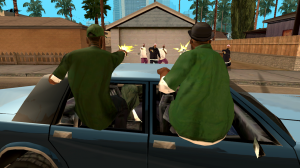 GTA: San Andreas, available for mobile devices. The PS2 classic game is back in all its glory to mobile devices. Grand Theft Auto: San Andreas is a game published by Rockstar Games, originally released for PS2 in 2004, which became the best known of the series game. It is an open world action-adventure game, the fifth title in the series and the third with 3D graphics. 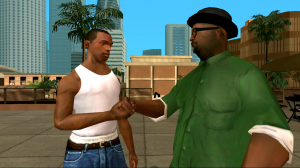 GTA San Andreas has just come to iOS and Android, with high resolution graphics specially adapted for mobile devices. Set in the 90’s, the game takes us back to California, where the fictional cities of Los Santos, San Fierro and Las Venturas are strongly based on Los Angeles, San Francisco and Las Vegas respectively. Throughout the game, we follow the story of CJ, who tries to restore his old gang after the murder of his mother. The story contains the same characteristic features from other editions of the series, such as crazy driving and shooting in the third person. A complicated point of this touchscreens adaptation has been the driving and shooting control. When we drive a vehicle we can choose from three different control schemes and customizable controls. There are also contextual options to display buttons only when you need them. On the other hand, in the shootings scenes we can quickly change objectives as we can point by touching on enemies. However, in both situations, the control is quite complicated in the intense moments, and we can easily find ourselves mired in utter chaos. Grand Theft Auto San Andreas is available for $6.99. You can save the game in the cloud and play with multiple devices. You will find it in Spanish, French, Italian, German, Russian and Japanese. You can download it from the Play Store, iTunes and Amazon Appstore, which can be installed in some models of Kindle Fire. So, yes, take patience and empty your device, because the game has 2.4 GB!